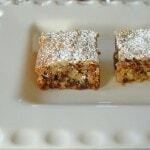 Nanna’s Chinese Chews – My mother-in-law’s date-nut bars based on a recipe from 1917! 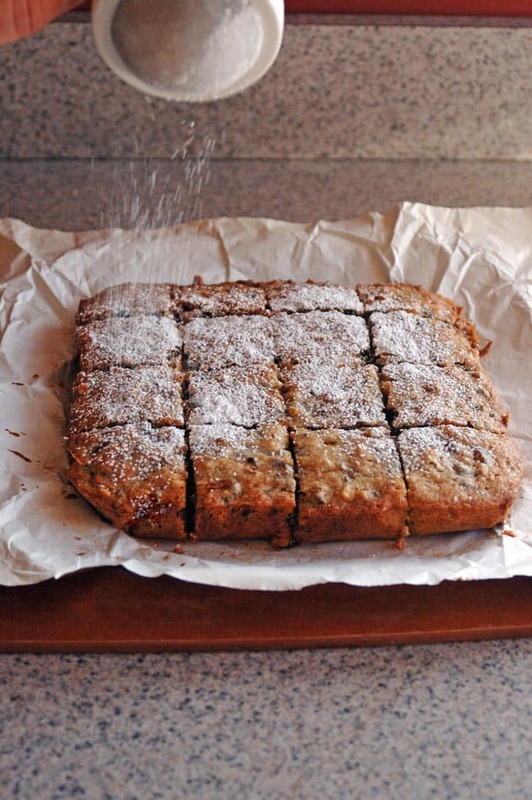 Delicious, buttery blondies. Have you ever heard of Chinese Chews? They’re absolutely delicious date-nut bars that were first published in the June 1917 issue of Good Housekeeping. They’re not from China at all, and some believe the name came from dates being considered an exotic ingredient. My mother-in-law (the grandchildren call her “Nanna,” pronounced “Nahn-Nah”) made these for years, and they’re one of my hubby’s favorites. I just had to get Nanna’s Chinese Chews recipe to share with you before the holidays. First, I have to admit that my hubby used to ask me to make these during the early years of our marriage, and it’s taken me decades to get around to it. In my defense….yeah, I’ve got nothing. I’m kicking myself though, because these bars are so outstanding and relatively easy. I can’t walk by the cookie container without slicing off a couple of bites. 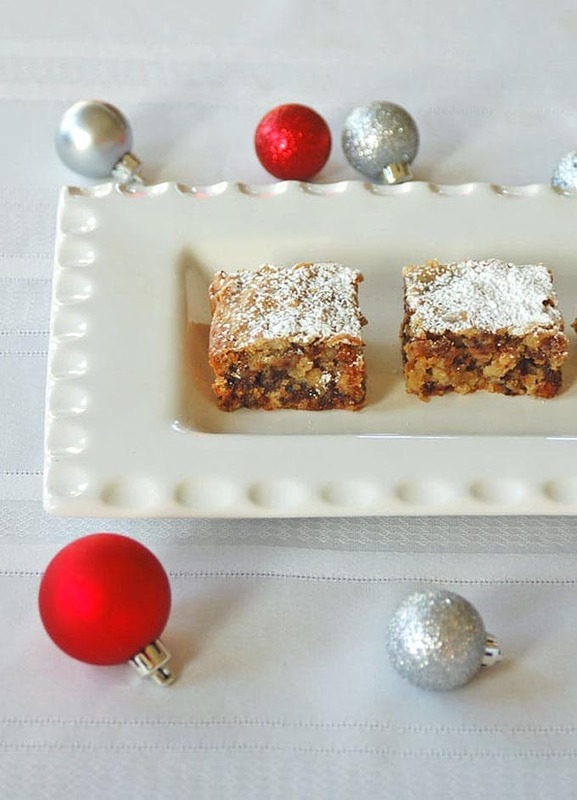 Think of buttery, chewy blondies with dates and walnuts, dusted in confectioners sugar…yum! Second, I have to tell you how we were just cracking up at my mother-in-law’s yellowed, handwritten recipe for “Chinice Shews.” Nanna, who is from Italy, had done her best in about 1970 to write down the recipe in English as it was told to her by a lady she knew. My brother-in-law texted me a photo and called to read the recipe in a heavy Italian accent, as my mother-in-law howled with laughter in the background. Priceless! Interestingly, Nanna’s Chinese Chews include melted butter, while the 1917 version contained no butter or shortening. Another thing I noticed, which I thought was odd — there’s no baking powder or baking soda in my mother-in-law’s recipe. My only changes were to increase the baking time, since mine needed it, and to recommend lining the pan with parchment paper folded over the edges, to make for easy removal and cleanup. I also included some ways to make the preparation easier. P.S. Happy Hanukkah to anyone celebrating! 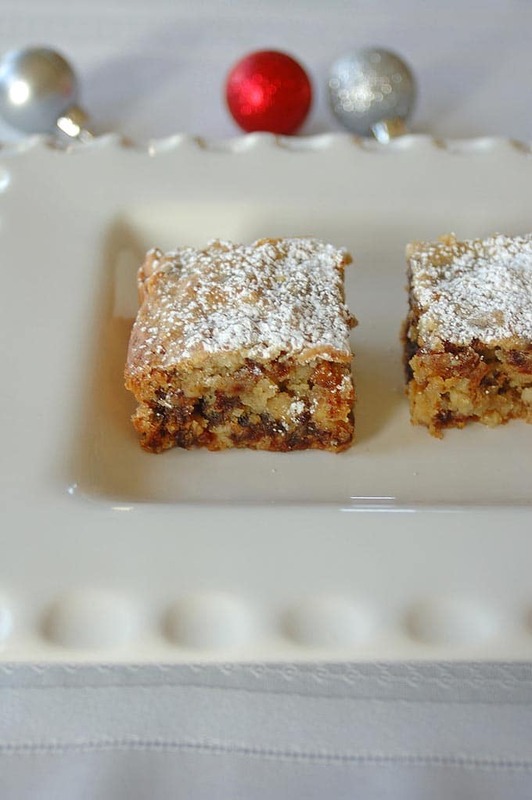 My mother-in-law's Chinese Chews are buttery, chewy blondies with dates and walnuts, dusted in confectioners sugar. An old family favorite! Chop your dates in a food processor or blender. (They are really sticky to chop by hand.) If starting with walnut halves, chop them until you have one cup. In a glass bowl or other microwave-safe bowl, melt your butter in the microwave, covering it with wax paper to prevent splashing. Stir in the sugar. Add the eggs and vanilla to your bowl and mix with a spoon until blended. Add the flour and salt and stir. Stir in the dates and nuts until blended. Pour the batter into your baking pan and use a spatula to even it out. Bake for 30-40 minutes, until the top is golden. A toothpick or cake tester inserted in the center should come out clean. If you're not planning to freeze them, dust with confectioner's sugar. Transfer the bars to a rack to finish cooling. They taste best when completely cooled. Store at room temperature in an airtight container. You can freeze them without the confectioner's sugar and add the sugar when they are thawed. I tried these today; only had about 2 oz. dates so I chopped up some raisins and an apple I had sitting around to get to the 8.5 oz called for. My hubby loved them! Moist and yummy! Thank you. Hi Shari – I’m so happy to hear that! Thanks for letting me know. These are my husband’s favorite treat. My recipe has baking powder but no fat. It also has chopped maraschino cherries. I think I’ll try adding melted butter. Hi Vickie – I love hearing about the variations people have for this vintage recipe! The butter makes these taste like blondies. I was raised on these. My mother’s recipe contains no fat, but does have baking powder. Hi Szarinda – Oh, that’s so interesting! 1917-???? Really…Wow amazing recipe Andrea. I know…an oldie but goodie! Thanks, Cheryl. Ha ha! I love the old fashioned recipes with their politically-incorrect names 😉 These look too good! They are really good, and I can see why they’ve been around so long. Thanks, Denise! I am all about this recipe for “Chinice Shews.” I can imagine the fun of hearing your brother-in-law read the recipe card! These look delicious and I can’t wait to try them…. Plus – there’s something about a recipe that’s been around since 1917. I love that! I know what you mean! I was geeking out on the history of the recipe and how it changed over the years.